I’ve argued hours about the voting body of the Rock and Roll Hall of Fame. They appear to be a rather secretive cabal under the control of Rolling Stone founder Jann Wenner. I’ve yet to meet a person who admits to being a voting member. Even a pal who has been rock journalist, an MTV news reporter, a critically acclaimed major label artist and an A&R guy responsible for a 16 million copies selling album has never been asked to vote. I’ve known people who voted for every other major award. I have had success twice with getting the ball rolling for filmmakers to receive lifetime Oscars. But get they mystery voters interested in nominating Todd Rundgren for the Rock Hall of Fame has been a fruitless cause. I swear it’s just Wenner with a cocktail napkin decided who gets nominated which normally means “Who did Rolling Stone magazine love?” I swear his deepest desire is to get Yoko Ono inducted. Luckily Rock & Roll Hall of Fame In Concert is about the one part I enjoy, the performances during the ceremony. When the Hall was starting out, the ceremony was not broadcasted so you could only salivate over the stories that came out. There was the year the Yardbirds were inducted that had Eric Clapton, Jeff Beck and Jimmy Page joining forces. After the ceremony there would be a jam session that supposedly went on until the last drop was drained from the bar with legends of music playing together. Eventually the ceremony came to television so that people who didn’t have connections and a $1,000 for a plate of rubber chicken could enjoy the evening. Rock & Roll Hall of Fame In Concert contains highlights from the induction ceremonies of 2014 to 2017. The 2014 ceremony at Brooklyn’s Barclay Center opens with the induction of Peter Gabriel by Chris Martin of Coldplay. The two duet on “Washing of Water” as Peter does “Digging In the Dirt” solo and brings out Youssou N’Dour for “In Your Eyes.” Cat Stevens returns to glory with “Father & Son,” “Wild World” and “Peace Train.” Linda Ronstadt wasn’t feeling up to appear on stage so the late Glenn Frey of The Eagles accepts her award while Emmylou Harris, Carrie Underwood, Stevie Nicks and Sheryl Crow perform her songs. The E Street Band induction might be the longest one on record, but at least at the end Bruce Springsteen performs with his band for “The E Street Shuffle.” Nirvana also has guest performers since Kurt Cobain has been dead for a while. But instead of having guys sing the lead, Dave Grohl, Pat Smear and Krist Novoselic share the stage with Joan Jett, Kim Gordon (Sonic Youth), Lorde and Annie Clark (St. Vincent). The 2017 ceremony kept the action in Brooklyn for the return of the Electric Light Orchestra although your dad will call them ELO. They break out “Roll Over Beethoven,” “Evil Woman,” and “Mr Blue Sky.” Joan Baez brings her folkie vibe to the festivities. Another band that should have been in a few decades ago is Yes. Sadly they perform without their leader bassist Chris Squire who died in 2015. Geddy Lee of Rush filled in that night, but Squire’s power would have been so much better on “Roundabout.” Jon Anderson did return for the night to sing. Fans must have been excited during the induction as Steve Perry stood with the band to receive their hardware. But the performance featured Arnel Pineda on the microphone. Tupac Shakur was inducted by Snoop Dogg, but nobody came on stage to give us “California Love.” Everything wraps up with David Letterman welcoming Pearl Jam into the Hall. Eddie Vedder gives an “Alive” that takes you back to the pit in 1991. The ability to get right to the music makes Rock & Roll Hall of Fame In Concert enjoyable. If I was forced to listen to the 8 hours of the E Street Band thanking everyone in New Jersey, I’d go nuts. But with a quick button push, we’re back to the rock and none of the talk. It’s a great sense of what you’d enjoy from a table at the induction ceremony and you don’t have to eat the chicken. The video is 1.78:1 anamorphic. 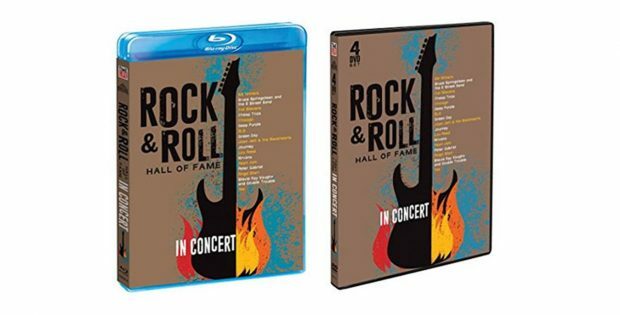 You will be able to see which of your rock idols have aged best in the 1080p transfer.the Audio is Dolby Digital 5.1. The levels are perfect for blasting apart your surround sound system. Time Life presents Rock & Roll Hall of Fame In Concert. Starring: Deep Purple, Peter Gabriel, Yes, Cheap Trick and Joan Jett. Rated: Unrated. Running Time: 674 minutes on 2 Blu-ray discs. Released: April 24, 2018.